For most women, the temporary loss of their hair is the most traumatic and difficult aspect of chemotherapy. The experience is emotionally draining, especially when coupled with the physical rigors of a new treatment schedule. 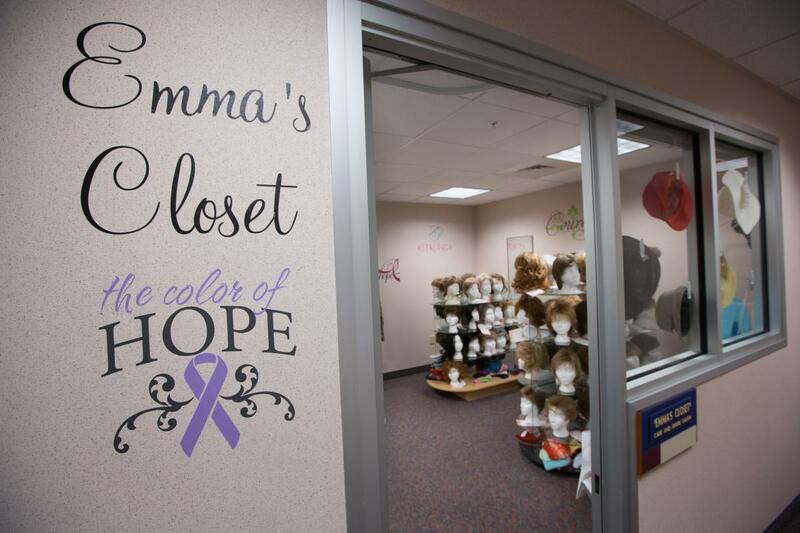 Enter Emma’s Closet; a salon located in the Cancer Treatment Center dedicated to helping women who are experiencing hair loss from cancer treatment. With the relocation of the Cancer Treatment Center to the South Plaza in 2000, plus a generous donation from a retired store owner, Emma’s Closet became a reality. Now there is a special place where women can obtain, at no charge, new and gently used wigs, scarves, hats, and turbans. Volunteer cosmetologists wash, dry, and style each donated wig before displaying it in Emma’s Closet. Approximately 15 to 20 wigs in different colors, styles, and lengths are displayed at any one time, with more awaiting their turn at styling. All Emma’s Closet services are free of charge.